I really meant to get this posted sooner guys and the delay has been for the simple reason that I wanted to put an in-depth review and reasoning for posting it. But that hasn't happened and I'm never going to get this out here if I don't just write something up and post it. I previously posted about a forum and later on, decided that I didn't want to support it after all. I'm not one to make the same mistakes twice, so I've given this one plenty of time before endorsing it. And by "endorse," I mean, "give free linky love because I can't offer much else," lol. So what is Bloggeries? 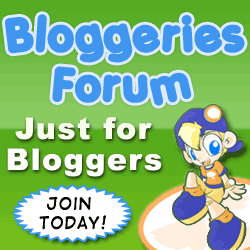 The main site is a blog directory, but it's the behind-the-scenes forum that really has my attention. I've been posting there for months and met a lot of great people while gather tons of helpful information. It's one of those places where it doesn't matter how new or old to the world you are (in this case, the "blogging world"), you still have a blast and get something out of it. Rob is running a contest this month for referrals and while I don't usually jump in on referral contests, I figured it was perfect timing to let my blogging friends here know about it. The idea is to get people to sign up and make at least 10 posts, which is easy to do once you get in there because there's tons of stuff to post on and you won't even notice you're doing it. The 10 posts is so you can post in the section to "show off your blog" and avoid those spammers. You'll get hooked before you know it anyway because it's not one of those forums where it's all about spamming your link all over the place. If you're into making money tips, it's there. If you'd rather learn the basics of blogging, that's there. Considering podcasting or selling your blog? There are sections for those, too. The best part is, I'm there, hehe. Okay, so maybe that's not the best part, but it's a perk, right? Please say yes, lol. Within a few weeks of actually posting there, I earned the name "resident smiley queen" because I add in quirky smileys where ever I deem appropriate around there, so I've got the fun and games part covered, too. If you're into just hanging out and getting to know other bloggers (like me!) in an atmosphere different than blog posts or following around comments, head on over. I also love Boggeries. My own blog has received a lot of attention from the site. Every time I post, I get views and comments. It's great. There are even a lot of people with something interesting to say. Some forums have 2 people saying something important and a bunch of people plugging their own stuff. I too, have been meaning to send a little link love toward them, I just have not gotten around to it. Your review was really well thought out, maybe I can just link to that page and go from there. It will be two plugs in one. Thanks for the plugs guys. I also love it coincidently and glad you're both members. Oh man...I want to join just for you but I don't know if I can handle any more online communities. I shall think about it but know my heart is there with ya!